Happy Monday everybody! Welcome to the ScotchBlue™ Painting Party! You’re just in time, because you’ve entered at the start of the party! A group of fantastic DIY bloggers, including myself, all completed projects with the help of ScotchBlue™ Painter’s Tape with Edge-Lock™ Paint Line Protector. Now we’re giving you the chance to see all of our fabulous projects and get some inspiration!! Check out my project tutorial below, and then jump to the next blog in the party to see even more inspirational DIY tutorials! 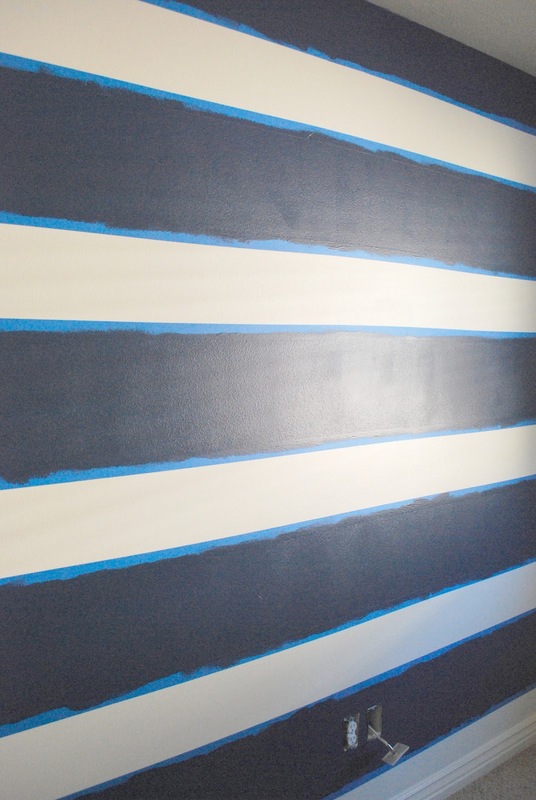 You'll also get a chance to win some ScotchBlue™ Painter's Tape so you can create a project of your own. Just read to the end to find out how! About two months ago, we moved into a new-to-us house. I'm really excited about the decorating plans that I've worked up for the new space, and now that those sweet kiddos of mine are back in school, I'm ready to get going. Here is a BEFORE showing you the boring state of the wall behind their bookcase. Yawn. But no worries!! Here's what I did to wake up that sleepy space! First, I wanted to start with a fresh, clean white base, so I gave the entire room two coats of Behr's Swiss Coffee (yeah, sounds like it should be brown, but it's white). 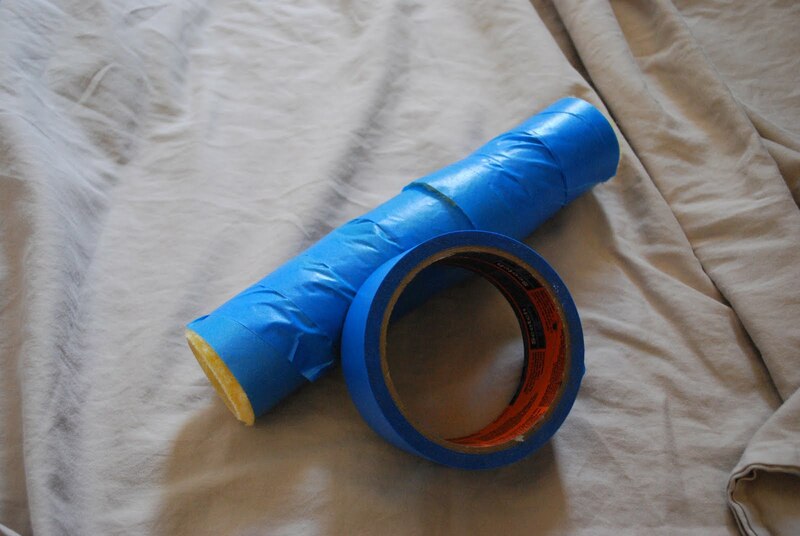 And to get my paint roller prepped, I used this painter's trick....take your painter's tape, and wrap it around the entire roller, then peel it away. This will remove any of those fuzzies that might be waiting to jump off the roller and into your smooth paint job. It only takes a minute, but it is worth it. Then came the fun part. First I measured out the lines. Since I don't have one of those fancy-schmancy laser levels, I did it the old fashioned way. I made pencil marks all the way across the wall at the heights that I wanted for each stripe (each stripe is 10" wide). Then I took my ScotchBlue™ Painter’s Tape with Edge-Lock™ Paint Line Protector and taped each line. In order to keep each stripe 10" wide, I alternated the sides on which I placed the tape. Since my base coat was white, I placed the tape on the "inside" of each line where the white stripes would be, making sure that there would be 10" of wall space for each blue (Martha Stewart's Azurite) stripe. Once the tape was up, I pressed it firmly along the edges to "lock" the seal. Normally, at this point in painting stripes, I would have sealed the edges with a stripe of the base coat color to prevent bleeding. But because I wanted to give the Edge-Lock Line Protector a fair try, I didn't do that this time. Then I rolled on two coats of paint for my blue stripes. I allowed the paint to dry overnight, and then pulled it off to reveal my stripes! I love them!! My walls are fairly heavily textured, and I think the Edge-Lock did well preventing color bleeds considering I didn't seal the edges with paint. I do think, however, that I would still seal them if I were to paint walls that are heavily textured in the future. But overall, I was pleased with the tape's performance. And ecstatic about the stripes! What a difference, huh? I'm lovin' it!! Simply leave a comment on this post telling me how you would use ScotchBlue Painter's Tape. For an additional chance to win you can Tweet “@scotchbluebrand I want #supersharppaintlines for my next project!” then come back and leave a second comment. And don't forget, here's a list of all the blogs participating in today's party...you'll want to visit all of them to get some great inspiration! Finally, if you'd like to find out about more of these great Painting Parties in the future you can "like" ScotchBlue on Facebook. What are you waiting for?? Go visit those other blogs and get inspired!! 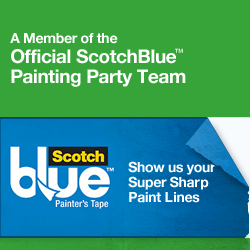 ScotchBlue Brand reached out to me to participate in the ScotchBlue Painting Party to celebrate the launch of their new ScotchBlue Painter’s Tape with Edge-Lock Paint Line Protector. My post represents my honest experience with ScotchBlue Painter’s Tape. I am not being paid for my answers, but I did receive ScotchBlue Painter’s Tape to assist in completion. The dark blue stripes are just lovely. I used the Scotch Tape when I did a stripe treatment in my office. It rocks. Looks awesome!! Love the color choices and thanks for the tip about the roller...I'll definitely try that! Looks fantastic! The tape really worked well with those contrasting stripes. I haven't ever heard the tip about covering the paint roller with tape, that's a good one! I love the stripes..and those adorable buckets! I want to do stripes in our bathroom...Start small as I am not a patient person lol. Looks great! I want to try painting chevrons! I *love* your dark stripes! I am getting ready to re-paint my front room--I could use some Scotch Blue for that project! Great stripes! Thanks for the tip about wrapping roller in tape. That will save me a lot of "picking". I have several paint projects going on and would love to try Scotch Blue. The bold stripes sure pack a punch! Love the graphic detail. I love Scotch Blue tape already and their new edge lock looks fantastic! I'd love to try ScotchBlue when I paint my bedroom. I absolutely hate when painting tape loses its stickiness and lets paint bleed through. Thanks for the giveaway! The stripes look great! I had never heard of painting over the tape with the base coat to seal it, what a great idea. I couldn't help but notice the Harry Potter LEGOs in your last picture. I'm a collector too. Great job - I would love to try the tape when painting my bathroom as I do not want paint of bleed onto cabinets, tub etc. Ok I HAVE to know where you got the tin pails, SO CUTE! 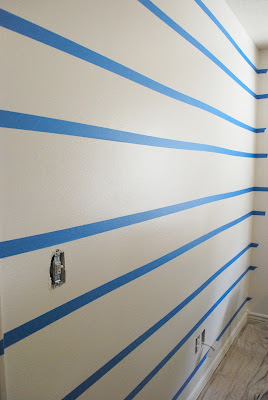 I'm getting ready to paint our guest bathroom and just got some scothblue tape, but I can never have enough! I want to paint our hallway in a striped pattern that matches our IKEA Lisbet rug. Love the stripes! 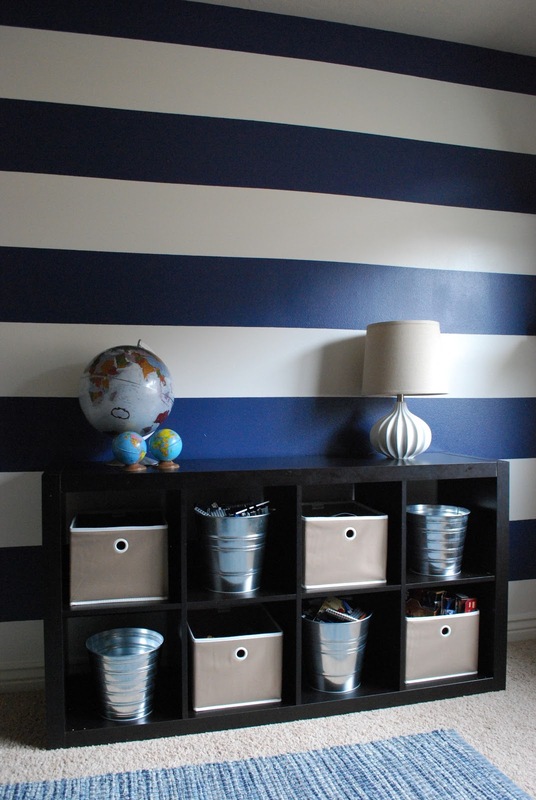 I would use the tape in my kiddos room, probably to do some stripes as well. thanks for the giveaway! Fabulous, Wendy!! I adore horizontal stripes! So did you guys buy your new house??!?! I would use the tape to mask the edges of our countertops when we paint our kitchen cabinets. We just painted stripes this weekend!! We are closing on our new house this week and every single room needs to be painted. I will need mountains of that tape! Firstly, blown away by you as usual. My next taper project is to get lots of different colours and start to use it for 'frames' for my kiddo's art work. WOW! 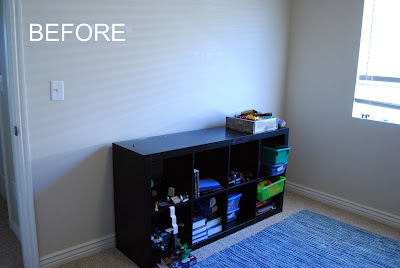 What fantastic look for a boy's room! I love it! Thanks so much for all the inspiration you spread! Awesome look!Thanks for the inspiration! I want to have stripes for our guest bathroom. i am so obsessed with navy and white stripes right now! i LOOOVEE yours!! I'm doing the wide stripe navy/white curtains in my boys room...wish i were crafty enough to do the walls! A quick, simple way to liven up that space! Now it looks like it needs some lockers or something...very industrial. I always end up needing to retouch my stripes, so glad that worked out! I would love to try the ScotchBlue Painter's Tape with Edge-Lock to paint a border on my Parlor wood floor. I have hesitated starting this project for some time, but I think I am ready to finally start! Thanks for the opportunity! It looks lovely! I still remember my painting stripes day. It wasn't one of my best days, but it all came out good in the end. Looks like you did it right the first time. I am sure your boys are crazy happy about the new look. 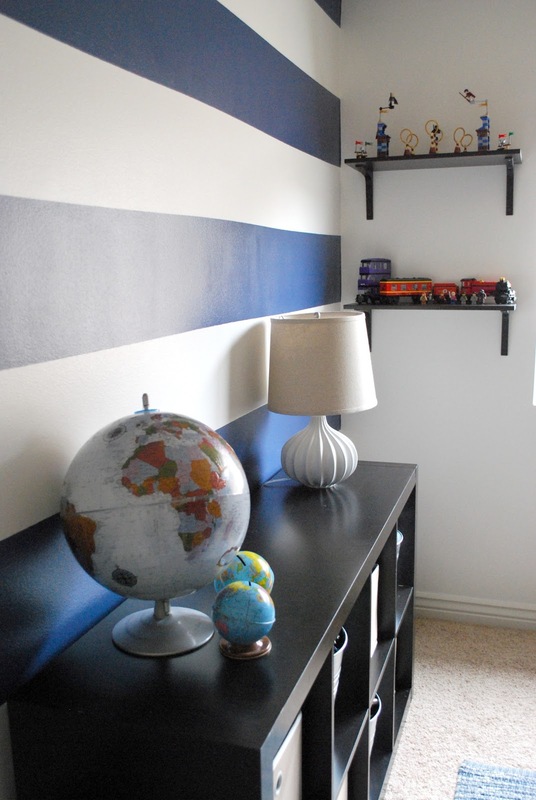 I'd love to paint some stripes like you did for your son's room! 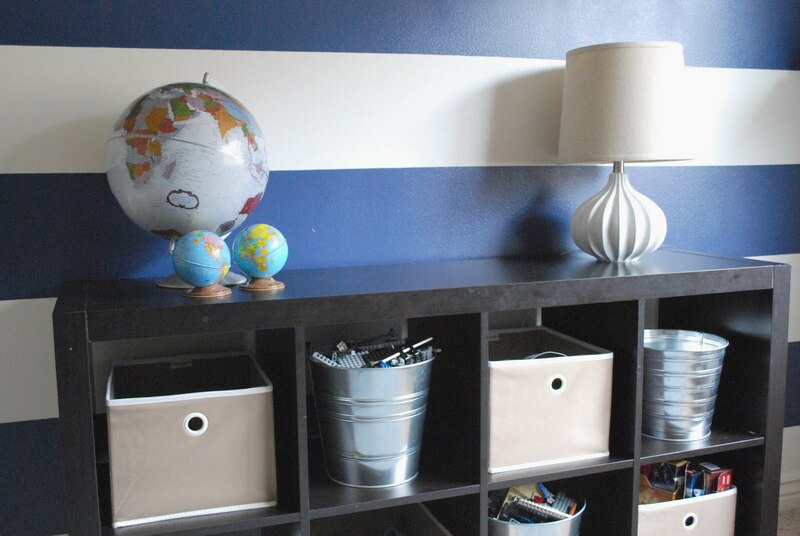 I was thinking about painting stripes in dark blue in a little boy's room too. Great job and thanks for the inspiration! That looks SOOOOO GOOD! I'm part of the Scotch Blue painters party coming up next week and I did some stripes too but I'm loving the boldness of your room. Great work! Head over and grab a button if you like.